I Do (Cherish You) by 98 Degrees melts hearts at itunes music store. Nobody gave a chance when this self formed all-American R&B boy band released their second album 98 Degrees and Rising late 1998.But they not only topped the R&B charts, they also reached the No.3 position in Billboard Hot 100 charts with their hit single "Because of You". Thanks to the extensive exposure given by Janet Jackson, when she allowed them to open for her, during her 1998 world tour The Velvet Rope Tour.The tour helped 98 Degrees promote their songs from their second album 98 Degrees and Rising. "The Hardest Thing","I Do (Cherish You)","True to Your Heart","She's Out Of My Life","Invisible Man" and "still" . 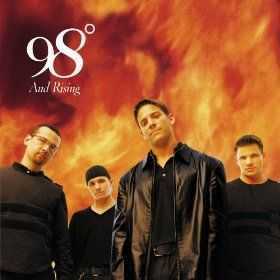 98 Degrees and Rising was certified multi platinum with more than 4.2 million copies sold world wide.Many fans attirbute the success of the album to a specific song "Because of You", the music video which received a positive response from the American audience for using state of the art technology in zooming and combining different video clips to form a single video. The whole album was focussed on a lonely sinlge girl,with whom the band members fall in love, visualize their love eventually singing for their love. "I Do (Cherish You)" is probably 98 Degrees' best music video as it has garenered more than 12 million views on Youtube with an overwhelming number of 'Likes'. The concept of "I Do (Cherish You)" has been admired by not only their fans but even their worst critic as it is based on a beautiful young girl who cheats on all the four members of the boy band 98 Degrees but marries a complete nerd. The members of the band Nick Lachey,Jeff Timmons,Justin Jeffre and Drew Lachey had come a long way, since dropping out of their colleges, quitting their jobs, toiling in the basement 20 hours a day just to create that perfect symphony for their songs. "True to Your Heart" a duet with the legend Stevie Wonder is an amazing foot-tapping number from their album 98 Degrees and Rising, which earned them a critical reception from The Rolling Stones magazine for it's use in the 1998 Disney movie Mulan.